After revealing four new budget-friendly Android smartphones, the DTC GT6 Astroid Jack, DTC GT7 Astroid Max, DTC GT8 Astroid Bit and DTC GT9 Astroid Pump last Wednesday. 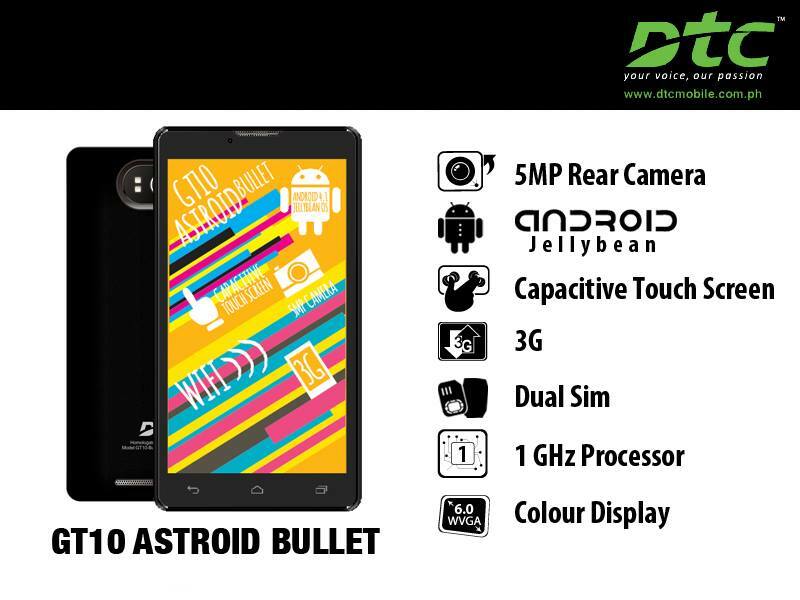 DTC Mobile, a leading creator of budget mobile devices in the Philippines just unveiled on their Facebook page the biggest smartphone in their line up called the DTC GT10 Astroid Bullet! More details after the jump. The DTC GT10 Astroid Bullet, is the second "phablet" device to be unveiled from DTC Mobile and unlike the 5-inch GT9 Astroid Pump, the GT10 boasts a large 6-inch WVGA capacitive display, 1.2GHz dual-core processor, dual-SIM, dual-standby capability, 5MP rear camera and runs on Android 4.1 Jelly Bean. CM FuBO 7inch IPS = 3999. I think I know what i'll buy.